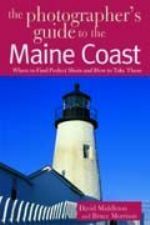 Photographer's Guide to the Maine Coast, by David Middleton and Bruce H. Morrison, 2004. Two veteran photographers guide you to 167 photo-rich sites up and down the Maine coast, from lighthouses and rocky beaches to quaint harbors and villages. Beautifully illustrated in color. Maps, directions and descriptions for each site. 112 pp, 6" x 9."